Owens Corning is seven years into our second set of 10 year environmental footprint goals. We have made significant progress yet we continue to look for opportunities to shrink our environmental footprint through a continuous reduction of resource use and environmental emissions from our operations. Our goals are for the period of 2010 to 2020 and based on what matters most given our specific operations. In October of 2015, we announced we had met our greenhouse gas and toxic air emissions goals ahead of schedule. At that time we made a decision to increase our 2020 commitments of 50 percent and 75 percent reductions for these environmental impacts respectively, and incorporated science-based greenhouse gas target-setting methodology into our strategy. Off our 2010 baseline year, we have now exceeded our goals for primary energy, water and fine particulate. We are on-track to meet our goals for greenhouse gas and toxic air emissions. However, we continue to be challenged by our waste-to-landfill goal. Achieved a 20% consumed energy intensity reduction and an 26% primary power intensity reduction since 2010. Approximately 39% of our electricity was sourced through renewable sources, such as wind, hydro, solar and geothermal across our portfolio globally; this metric is defined as the renewable energy sourced from the grid as well as that sourced from agreements. Within the United States, approximately 56% of our electricity was sourced through renewable sources of wind (54%), hydro (1%), and solar (1%). This percentage includes renewable energy sourced from the grid as well as that sourced from power purchase agreements (PPAs) that provide us renewable energy credits. Of the 56%, Owens Corning is proud to state that 52% is directly attributable to our renewable energy programs with a breakdown of 51% from wind and 1% from solar. Owens Corning’s Fairburn, Georgia, plant became home to a 1-megawatt solar project. Through a partnership with Constellation and Georgia Power, a solar power system comprising nearly 3,000 photovoltaic panels was built on the plant site. The project is expected to result in an estimated 1,054 metric tons of CO2 reduction during its first year of operation. Since 2006, Owens Corning has implemented more than 1,125 energy-use reduction projects in its facilities across the globe, which together have reduced our MwH usage by more than 1,250,000 MwH. Reported a 48% reduction against our 2020 Greenhouse Gas goal with a base year of 2010. Achieved 23% absolute reduction in Scope 1 emissions and 34% of market-based Scope 2 emissions from 2010 to 2017. Owens Corning enabled, through our power purchase agreements, new wind power capacity of 250MW which came online in 2016 and had a substantial impact on our scope 2 GHG emissions. For the second year in a row Owens Corning received a level recognition for 2017 CDP Climate Leader’s for our disclosure and reporting on our GHG emissions. Owens Corning received A level recognition for our 2018 Supply Chain disclosure and reporting on our GHG emissions. 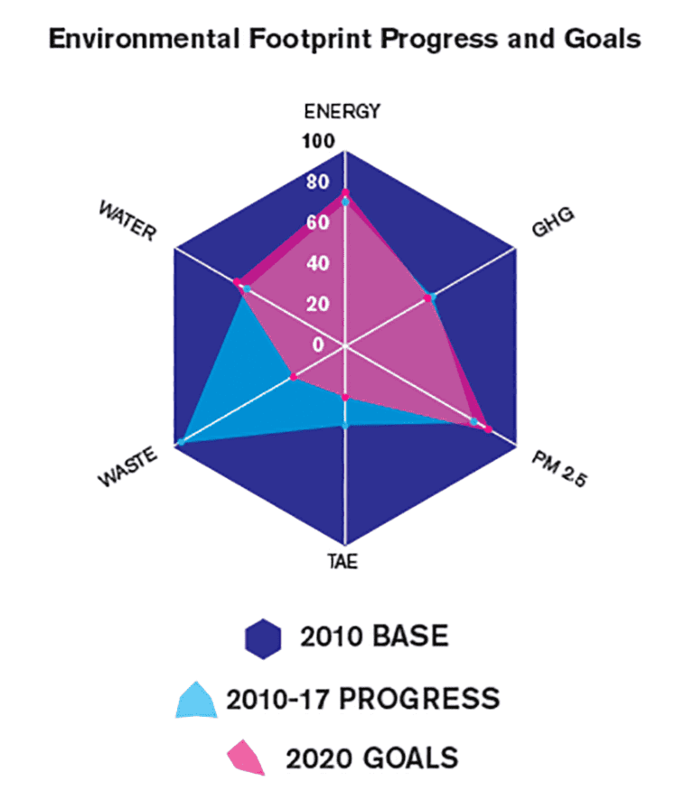 Due to acquisitions, our absolute weight of PM2.5 has increased by four metric tons in 2017 from the 2010 baseline, but our weighted intensity percentage reflects a 25% reduction from the 2010 baseline. The residential EcoTouch® insulation conversion has driven much of the improvement to date. As evidenced with the conversion, the key to achieving further gains will be capturing more synergies between greening our products and greening our operations. Owens Corning defines Toxic Air Emissions to include the following: hexavalent chromium, formaldehyde, manganese, polycyclic aromatic compounds and ammonia. This shift in focus for air emissions acknowledges our past successes and our concern for pollutants that carry greater air quality concerns. In October 2015, Owens Corning announced it established new 2020 sustainability goals to reduce toxic air emissions intensity by 75% from our 2010 baseline. Achieved a 48% absolute reduction in Toxic Air Emissions and 61% reduction in Toxic Air Intensity since 2010. Achieved a 4% reduction in waste intensity and have increased our overall diverted tons by 48% since 2010. Waste to landfill reduction is our largest challenge. Our businesses are continually seeking opportunities to reduce waste at the facility level and their performance is being reported at the enterprise level. To achieve our targets, we conduct periodic reviews to assess the progress and take necessary corrective actions. The Composites business has formed a cross-functional team called the “Material Revolution,” the purpose of which is to help identify, prioritize, and drive waste reduction, reuse, and repurpose efforts across the business. One of our mineral wool plants has been working with Waste Hub, an engineering/marketing firm, to develop a process that will not only reduce WTL, but also turn two of their waste streams into revenue-generating products. Implementation of this program is planned for mid-2018. We have recently executed an agreement with a recycler that has an end-use application that could potentially re-use nearly all the composite byproducts generated by our Jackson and Amarillo plants. Implementation of this program is planned for mid-2018. We recognize our facilities globally on their level of diversion from the landfill regardless of production volumes. We believe this is an important measure so that we properly recognize facilities where the absolute amount of waste going to landfill has been reduced in addition to our intensity measures. Facilities are recognized at three different levels: Silver at 80% diversion from the landfill; Gold at 98% diversion from the landfill; and Platinum at 100% diversion from the landfill. In 2017, we are proud to say 6 were recognized as Platinum, 6 as Gold, and 21 as Silver. We expanded our relationship with Hose2Habitat with approximately 33 global locations actively collecting or donating items for animal enrichment. This year approximately 5% of our water was recycled across our global locations while we report our recirculated water constitutes 2,021% of our total water use. Our conservation and efficiency efforts have saved an estimated 12,114,030 cubic meters of water since 2010. We also estimate that our efforts have saved more than $9.2 million in water-related costs. At facilities where it is determined that water intake and discharge are critical we implement additional monitoring and treatment processes best suited for the specific needs of the given sites. Owens Corning continues to perform analysis on water stress using the WBCSD Global Water Tool to understand our risk areas and develop steps for mitigation and management. Owens Corning received A level recognition for 2017 CDP Water for our disclosure and reporting. To assist in our reduction efforts, Owens Corning implemented an enterprise wide software solution to better manage our environmental sustainability data and ensure our facilities have data to make decisions and are informed of their impact on our goals. The system combines quality assurance and data capture capabilities while allowing a streamlined external audit process. To ensure consistency and standardization, Owens Corning follows World Resource Institute (WRI) Corporate Accounting & Reporting Standard for all our environmental reporting. We report under operational control. The company's six aspects are shown in the footprint graphic below. The 2010 baseline year is shown as the dark blue outside border of the spider chart, representing 100 percent of each aspect. The pink center footprint indicates the company's 10-year intensity goals. The light blue footprint represents our status at the end of 2017. This table shows the actual values of the monitored parameters in 2010 and 2017. PM 2.5 — Particulate matte with a mean diameter of 2.5 microns or less, defined and reported according to regional government requirements. TAE— Toxic air emissions include hexavalent chromium, formaldehyde, manganese, polycylic aromatic compounds and ammonia emissions. Intensity is normalized based on product produced. For more information on our programs and efforts related to our goals view our annual sustainability report. To view the assurance statement, please see pages 230-232 within Our 2017 Sustainability Report. Click here for additional information on the economic and social metrics verified through SCS. The boundary of all these aspects covers our entire global operations including Asia Pacific, Europe, Latin America, Canada and the United States. The internal boundary includes all Owens Corning plants and offices that are owned and leased.